I visited with my 6-year-old during a recent day of Spring Break to check things out. 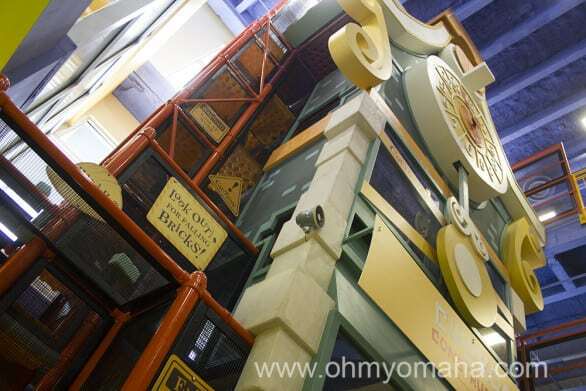 It’s been two years since we last visited Lincoln Children’s Museum, but two of the biggest updates have only happened at the end of last year: Cuckoo Construction and The Grow Zone. The museum gave my family complimentary admission so I could tell you all about them. You can’t miss Cuckoo Construction, literally. 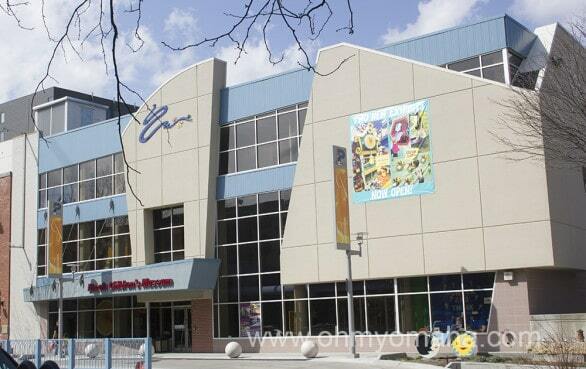 The three-story exhibit catches your kid’s attention right when you walk in. The view of Cuckoo Construction from the museum’s lowest level. The third level has a wheel chair-accessible entrance. Farley made a beeline for it even before I could get us into the museum. Cuckoo Construction, presented by Hausmann Construction, is a clock tower kids can climb, but the fun part is all the construction they can do. Foam bricks fall every 15 minutes from the Cuckoo Construction tower. Kids rush to build walls, sending them up a conveyor belt or moving them with a mini wheelbarrow. Every 15 minutes, the cuckoo comes out and cues the walls of bricks to come tumbling down. Kids love it and for a second, I thought my son wasn’t ever going to leave that exhibit. 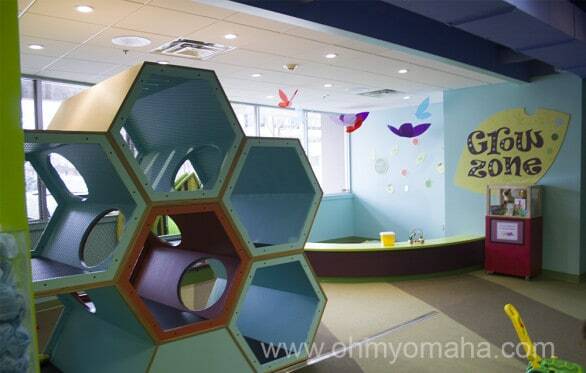 The Grow Zone at Lincoln Children’s Museum is a new area for children 3 and younger. Farley was too old for the new Grow Zone and determined to play elsewhere, so I only got a peek at it from the outside. This area is separated from the big kids stuff and looks like a little garden. It’s a calm play zone for children younger than 3. It’s a huge upgrade from what was in its place before. 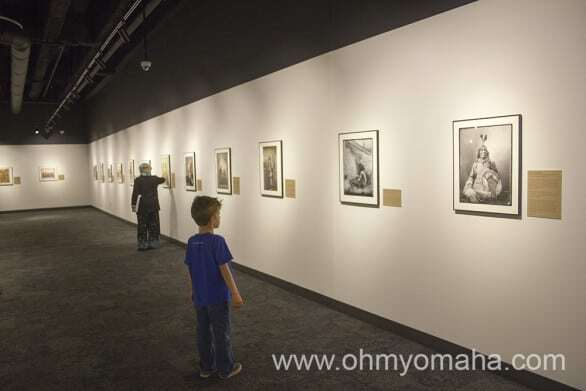 The Nebraska History Museum exterior was freshened up just as the interior was. “Inside Out” is the name of the artwork on the walls, showing pedestrian and passing cars a hint of what’s inside. 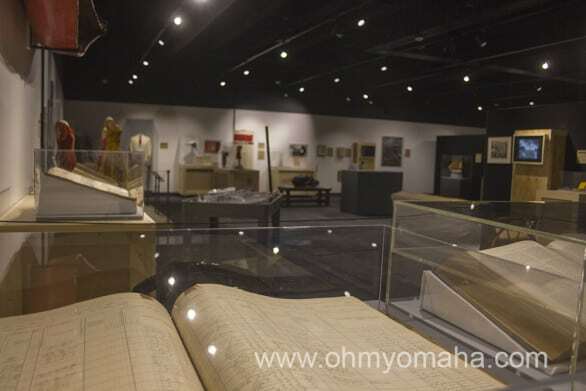 Confession: I’ve never been to the Nebraska History Museum until last week when it was about to reopen. It’s been around for decades. Anyway, I can’t offer any thoughts on the improvements. But from what I gathered on the preview tour of the museum, the updates were sorely needed and the museum is ready for bigger and better things. Artifacts on the second floor of the Nebraska History Museum. 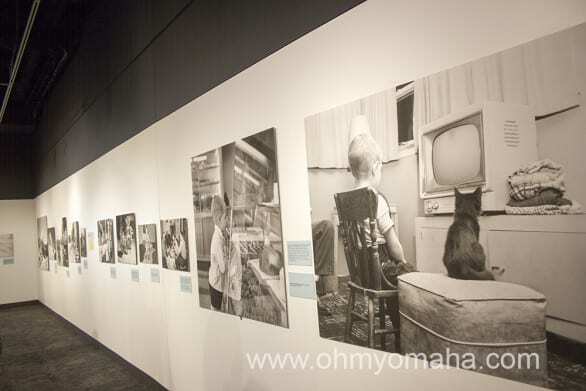 On two floors, the museum tells Nebraska’s story through displays, photography and audio/visuals. My 6-year-old tagged along on the tour, but I think this is the kind of place that would be enjoyed by multi-generations together. I think it would’ve been fun to have my dad along with us. The first floor features a quilt display, which signage explaining who made each, why, and where they were made. 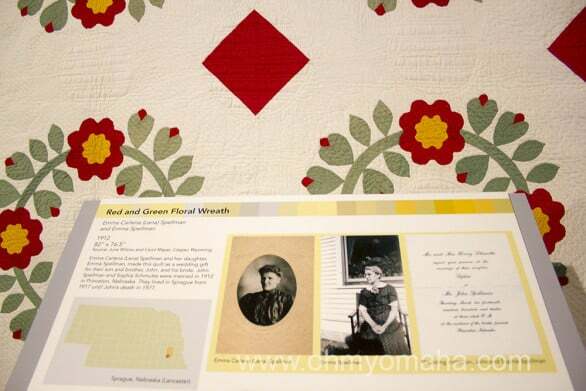 The quilts offered a unique glimpse into every day life of Nebraskans from more than 100 years ago. This one was made as a wedding gift and the display included the wedding invitation. 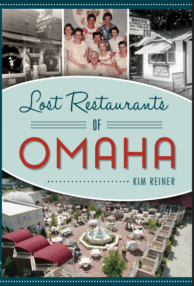 There’s also a photography exhibit by Barbara and Ralph Fox, which my son enjoyed, especially the photos of a blizzard, flood and the Nebraska State Fair (not in that order), and a gift shop. The second floor had the really good stuff and will be where most families will spend the most time. 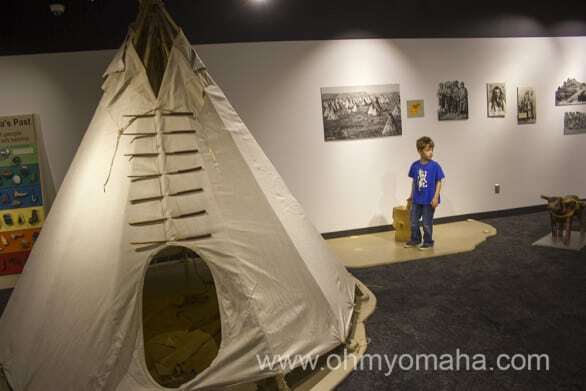 For kids, there’s a corner with hands-on activities, clothes for dress up and a teepee to climb in. Churning butter at the Nebraska History Museum. 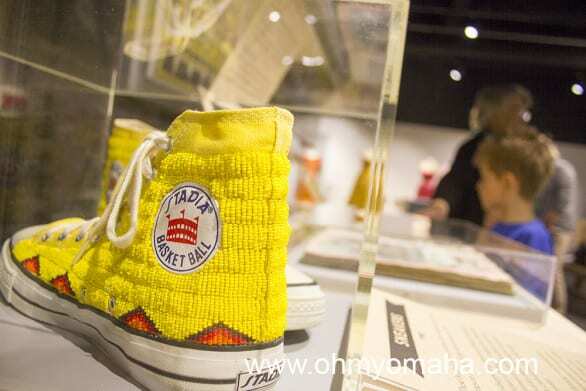 The majority of the floor is “Nebraska Unwrapped: Selections from the Collections,” and it takes us through the state’s history via displays of artifacts from colorful beaded sneakers and ball gowns to audio recordings, books and so much more. Some items were more than 1,000 years old. Beaded sneakers at the Nebraska History Museum. There’s also a photography exhibit on that floor called “Photographers and the Plains Indians.” The tour guide had some pretty interesting stories explaining some of the portraits. Farley was fascinated by some of the stories about the Native Americans in some of the photographs. The nice thing about this museum is that admission is FREE (donations accepted). They have a free tour every day at 2 p.m. and on the weekends this april, they’ll offer arts and crafts. 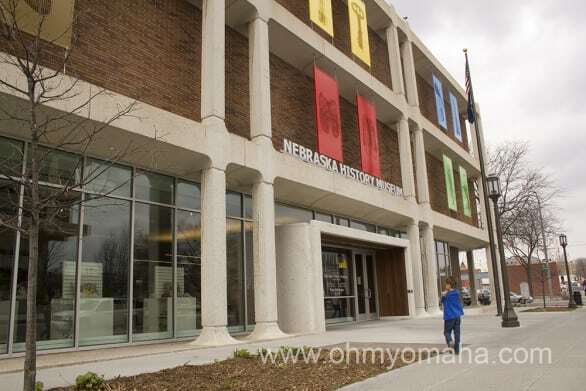 The Nebraska History Museum is super close to the children’s museum, and you can easily visit both in a visit. I recommend going to the history museum first, because it’s a struggle to get kids out of a children’s museum. The Centennial Mall was built in 1967 to commemorate the state’s 100th anniversary. 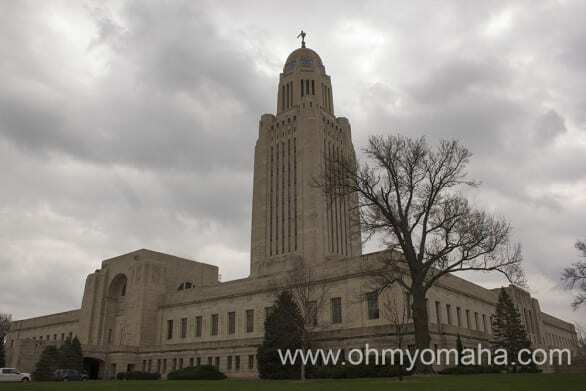 It’s a scenic connection between Nebraska’s most important institutions: the State Capitol (pictured, obviously) and the University of Nebraska. Centennial Mall is undergoing a redesign and it’s going to be a pretty cool thing to check out once it’s all finished – especially the area by the Lincoln Children’s Museum and the Nebraska History Museum. The mall stretches from the University of Nebraska-Lincoln campus to the State Capitol Building, from K Street to R Street. Each block will have its own theme. The plaza by the children’s museum will be “Sparking the Good Life – Imagination to Innovation” (P to R streets), and the highlight will undoubtedly be the sprayground (they call it a “kinetic water feature” but we all know what that means). It will also have an art alcove and an amphitheater-type seating area. Farley tried to find our county among the tiles lining one block of the mall. – “We the People” (K to L streets) – There will be a formal, ceremonial plaza with a fountain, and it will recognize “Watchful citizens” and state leaders. – “Our Home Nebraska” (L to M streets) – The hope for this block is that students and visitors will congregate there to learn more about Nebraska. The state’s natural resources will be highlighted here, with a block-wide outline of the state with rivers and eco-regions featured. 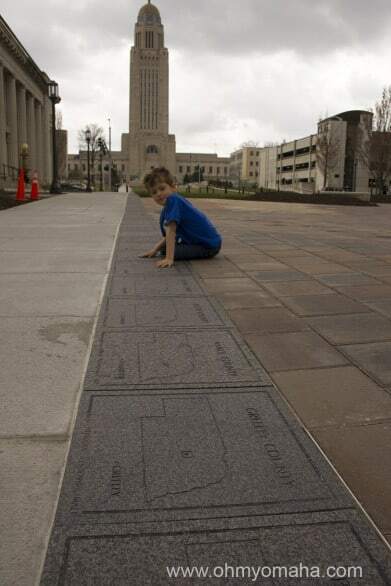 – “Mosaic of Nebraskans” (M to P streets) – This three-block area highlights the people, cultures, and organizations that have come together over time to create a social quilt of Nebraskans. 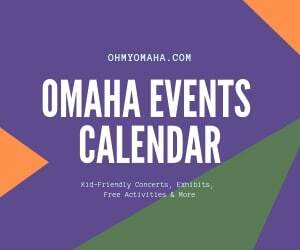 Where: 1420 P St., Lincoln, Neb. Where: 131 Centennial Mall North, Lincoln, Neb. When: Monday through Friday, 9 a.m. to 4:30 p.m.; Saturday and Sunday, 1 to 4:30 p.m.